In May, a test of Elon Musk’s Hyperloop transportation concept was conducted in the Nevada desert. While much of the discussion around the Hyperloop’s potential has been in the area of cargo transport, the project has always been envisioned as a people mover. In 2013, when the idea was initially released, there was a public comment period. 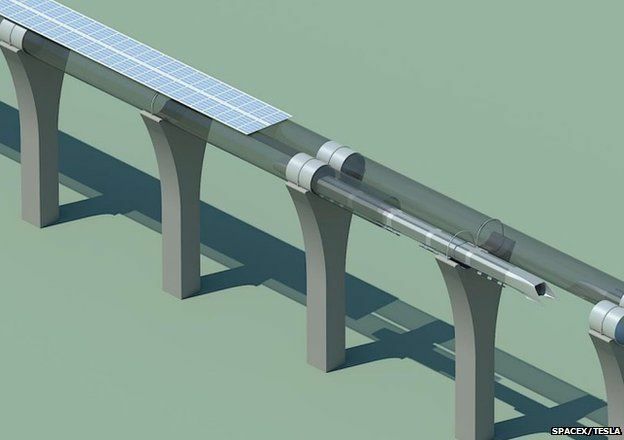 The initial submittals outlined the Hyperloop concept, including the structural components like the stanchions or “pylons” that support the elevated track and low pressure tube. On August 13, 2013, I submitted the following commentary for the consideration of those working on the project. My comments outline some of the security issues that the new transportation infrastructure brings to mind. Seldom do security professionals have the opportunity to consider the security of critical infrastructure systems BEFORE they are built! I never received a response, so I place my comments here for posterity and invite comment and discussion. The pylons are the most significant structural components of this system. Security considerations affect some of the efficiencies cited as advantages. Given the proposed spacing of 100 feet and the tube wall thickness of less than 1 inch, it is assumed that the failure of any pylon given the 100 foot spacing could cause system failure. As both outbound and inbound tubes are supported by the same system of pylons, there is no redundancy. Further, bad actors may come to understand the single point of failure and target remote and accessible supports. As such, the following considerations are respectfully offered for your perusal. The pylons must be secured from attack. The risk of earthquake is significant, but so is the risk of terrorist attack. Transportation sector targets are favored by terrorist groups (i.e. underwear bomber, 9/11, Sarin gas in Japan, Madrid bombings, London bombings, etc). Thus the pylons must be secured from tampering by criminal or terrorist elements. The modes of attack may include explosives (especially directional or “shaped” charges commonly used in building demolition to fail reinforced concrete columns), projectiles, or mechanical demolition. The threat of these attacks may be diminished by making the pylons less accessible. This may be accomplished by purchasing surrounding property to create standoff distance. However, this undermines the claim that pylons need less space than other modes. Fencing or barriers may be installed. However this undermines the claim of aesthetics. Pylons may also be secured via electronic means that provide detection and alarm if approached. However this will require response elements be employed along the length of the system in order to interrupt a potential attack in time to mitigate damage. Finally, accessibility could be reduced through the use of innovative techniques related to CPTED or “Crime Prevention Through Environmental Design”. This might include the placement of pylons in inaccessible areas or in areas of controlled access (i.e. BETWEEN the lanes of the interstate). This may greatly reduce options for placement and raise costs. As the risk of the destruction of TWO adjacent pylons is much less than the risk of a single pylon being impacted, it is appropriate to consider redundancy to reduce risk. Options for redundancy in the pylon system include the use of different, structurally separate pylons for outbound and inbound traffic tubes, or an increase in the number of pylons (decrease the spacing) to achieve a safety factor (i.e. 50 feet instead of 100 feet). Each of these options raises costs significantly. Ultimately, the final designers will likely have to consider that the best option is to do both AND install crossovers throughout the system that would allow a hyperloop pod to switch from one tube to the other, offering a way to transport riders to their destination (rather than back to the origin) in the event of tube failure or interruption. These are some initial thoughts that I hope you find helpful. Best of luck with your project!